I have spent countless hours working on home renovation projects. The hallway stair job took three or four weeks, the small little hallway took two weeks. Everything has been labor intensive and taken days to complete. Then I painted my kitchen. 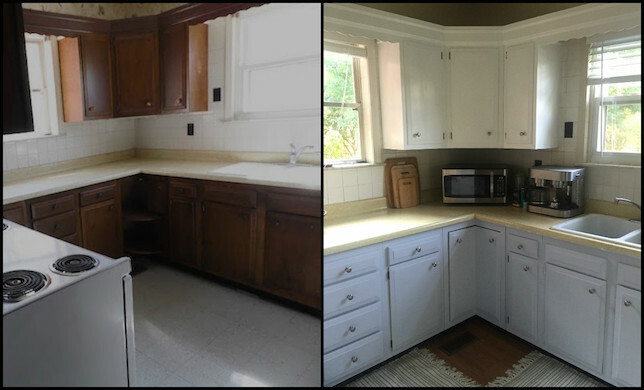 It was hands-down the easiest renovation project I have done to date. And my mind is absolutely melting over the fact that it is the biggest, best, most amazing, feel-good Home Renovation transformation yet. I just can't get over it. 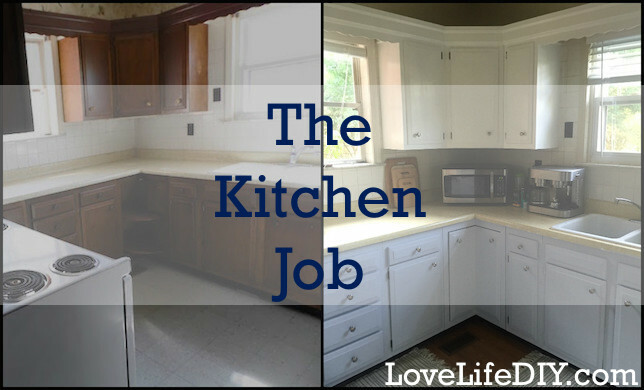 It has been the most amazing process redoing my kitchen. All I did was paint the cabinets and change the hardware. That's it. But it, somehow, changed everything! The way I feel about my kitchen. The way it looks. The size of it. Everything. If you follow me on Instagram, then you know, I painted the corner of my kitchen first. Not only did I fall in love instantly, the Aussie did too! He looked at me and said, It looks good! Go ahead, paint the bloody kitchen. 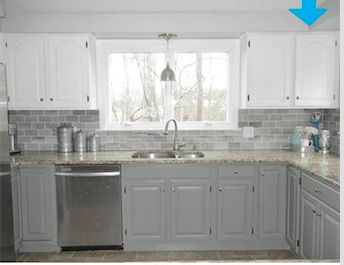 I saw a kitchen on Pinterest that was half gray and half white. I loved it. And, had to try it. Only, I had a gallon of blue-silver-grey paint on hand. Over the next three days, I took every door and drawer off and painted and painted. Then, painted some more. When it got dark, I moved the party inside. I was determined to finish over the weekend. I also left everything in the cupboards. I just the contents of each shelf as far back as I could. Thanks to free one-day Amazon Prime delivery, I was able to order 50 cabinet knobs (2 packs of 25) for $47, and have them at my door Saturday afternoon. I couldn't believe how well everything came together. Then, while at Target in between coats of paint, I nearly died when the most perfect rugs were on clearance for under $10. I bought 2! They are puuuuuuurrrrrrrrrfect! NOTE: You may notice a different floor from the before photo. That photo was taken the day we first saw the house. The floor was thought to be asbestos, so we did the most environmentally friendly thing possible, cover it. My mom walked in and gasped. 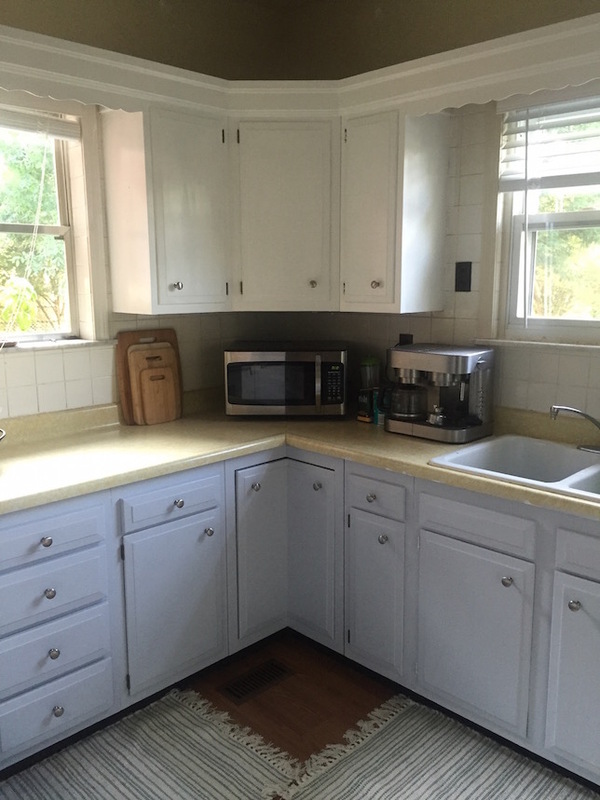 Then said, This isn't even the same kitchen. It's like it's brand new! That's exactly how I felt. It's this new fun space with endless possibilities. It took me two years, but now I love and embrace my little kitchen. Most of all, I love that I took a chance on the two colors. While, I am not too sure about it, every time I look at my kitchen, my heart smiles. I'm not bothered by the horrible countertops or being closed in. For the first time in two years, I love my kitchen! And all it took was a weekend, three coats of paint and the balls to try something different. 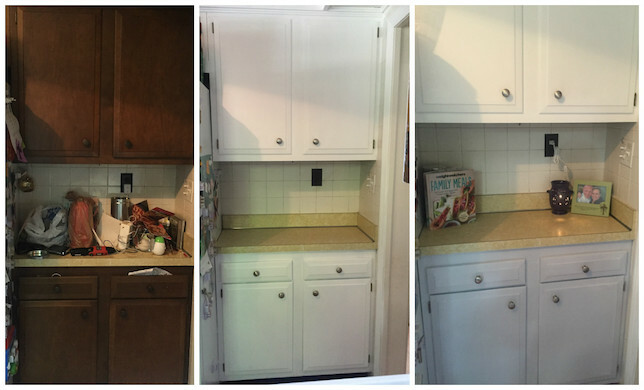 I cannot recommend enough doing this if you hate your kitchen. Take the leap, it is SO worth it!